Guess where we’re going?!?!? It’s time for our annual vacation to the most magical place on earth!! 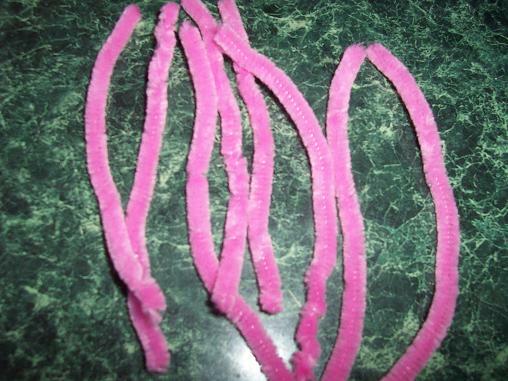 I showed you our spider we made out of playdough and pipe cleaners yesterday to go along with “The Itsy Bitsy Spider” song that Hailey loves. 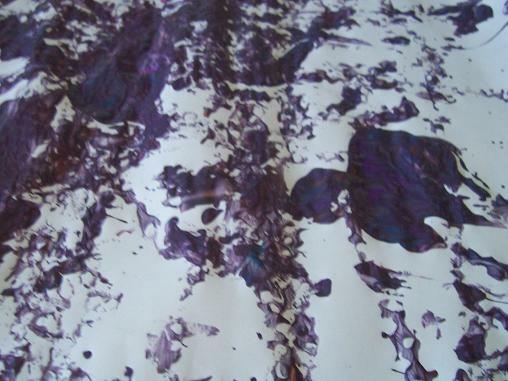 So, I had a fabulous idea that we could do some “ball painting” to create a spiderweb look. It didn’t exactly work. 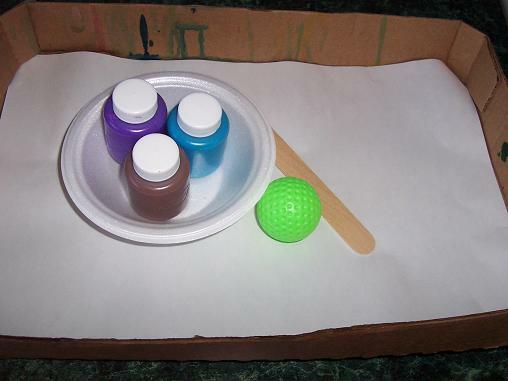 Here’s what you’ll need- paper, ball, paint, bowl, something to stir if you want to mix your paint together, and a box with sides. 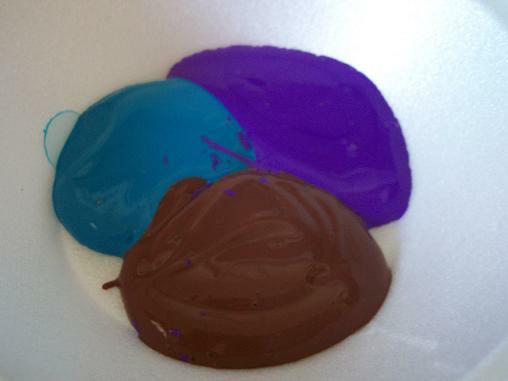 Put some paint in the bowl. Stir it up to create a fun new color. 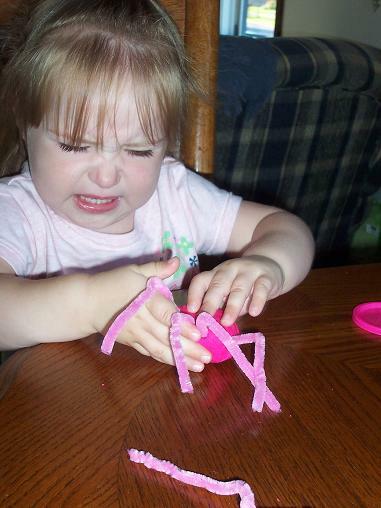 Or make your toddler upset because she has just decided that she doesn’t like mixing the colors together. Next you should be able to put the paper inside the box with sides, add some small drops of paint to the paper, and then tilt the box to make the ball roll which will create lines all over the paper (our spiderweb in this situation). The problem was that I used one of Hailey’s golf balls- so it is hollow and didn’t really weigh enough to roll through the paint. It kept getting stuck in the little paint blobs. 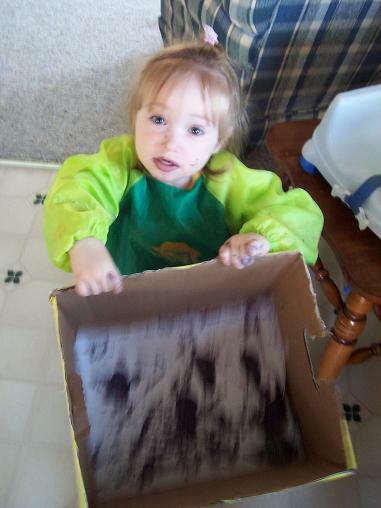 So, we tried a deeper box so that Hailey could shake the box harder without the ball flying across the room. 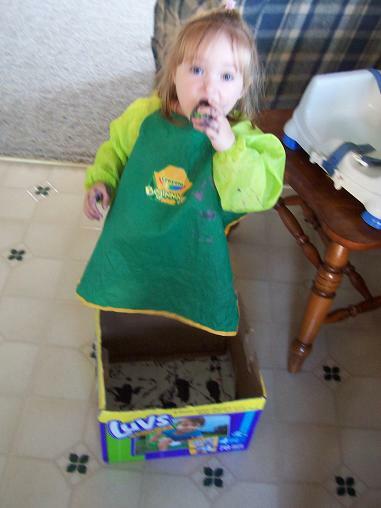 This is the reason we didn’t use marbles (which will give you the best results- but only if your children no longer put everything in their mouths). The golf ball is covered in paint and is being inserted into Hailey’s mouth. Here is our finished spiderweb. 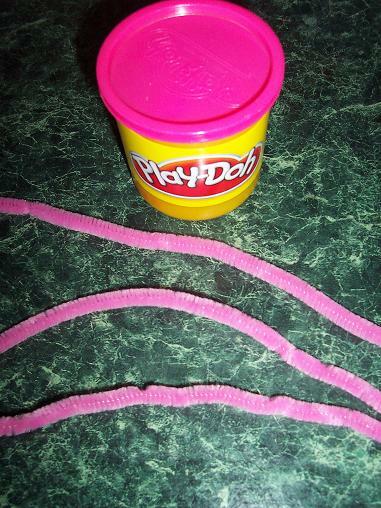 Which looks nothing like a spiderweb. 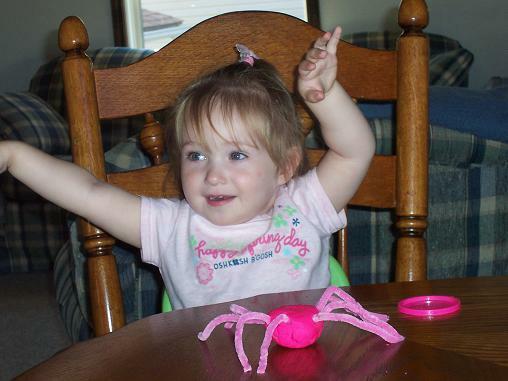 BUT, Hailey had fun making it and that is what matters. With fall on it’s way (only a month away!) 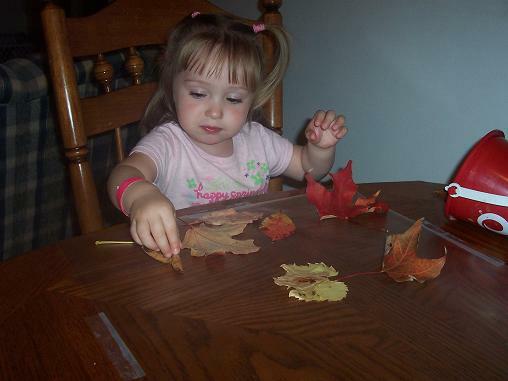 I thought I’d review some of the fall crafts we have done. 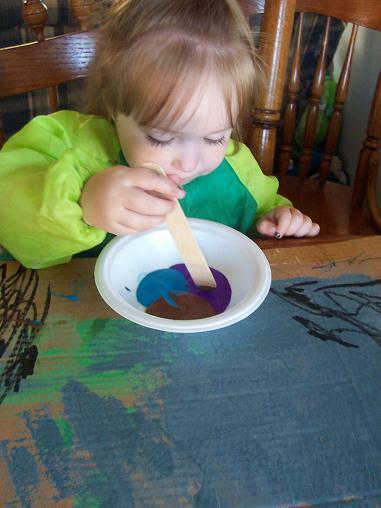 We collected some pine cones and leaves outside and then used them to paint with. 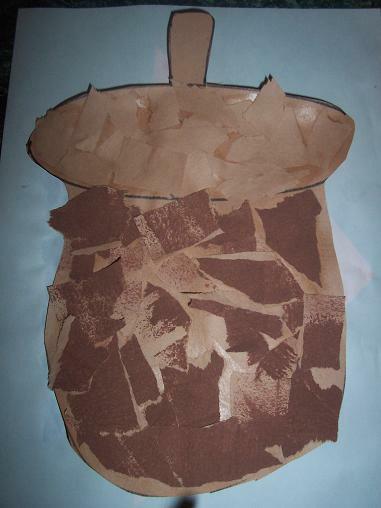 We also put some of the leaves onto contact paper and saved them. 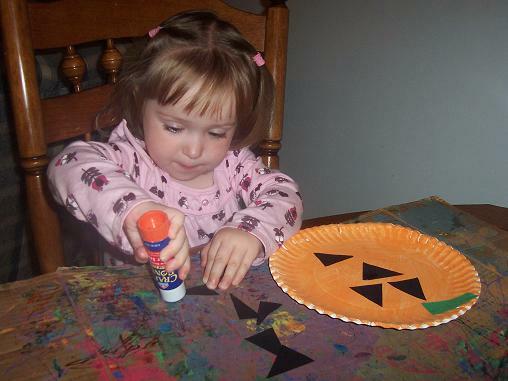 Hailey painted a paper plate orange and then added black triangles to make a pumpkin face. We cut open a pumpkin for Hailey to explore the inside of it. 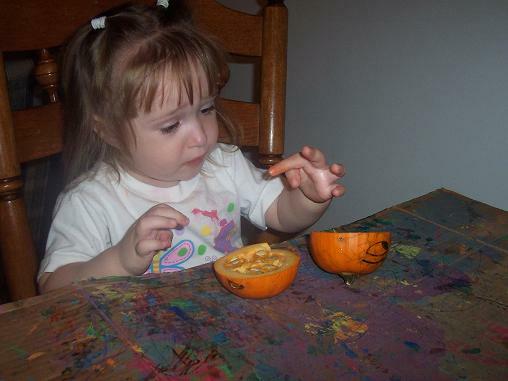 Then she dipped the pumpkin in paint and made pumpkin prints. 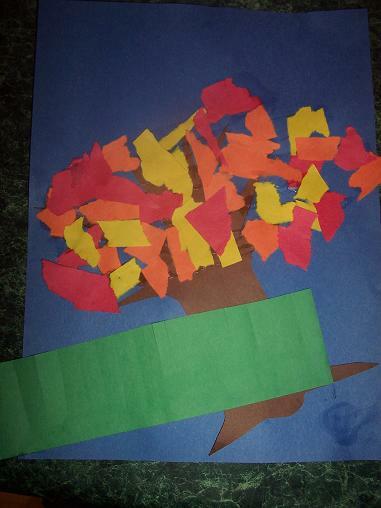 Hailey made this fall tree. She also made this acorn. 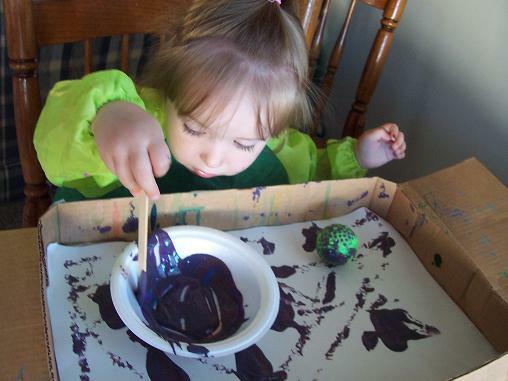 For more fall ideas you can click here for all of the fall activities we did last year.